In June, NATS handled 224,716 flights, which was an increase of 2.5% compared to June 2014. These latest air traffic figures confirm that the number of flights continues to increase on a month by month basis. According to NATS internal traffic data, transatlantic arrivals and departures remained buoyant and grew by 6.1% in June 2015 versus June 2014. Non-transatlantic overflights also increased, with growth of 6.1%. Domestic flights increased by 4.3%, which is the eighth consecutive month of growth recorded for this sector. The increase in domestic flights can be partly attributed to new routes being added between London and Scottish airports, as well as additional routes from the Isle of Man, Southampton and Manchester. There were also increases in non-transatlantic arrivals and departures and transatlantic overflights (1.9% and 0.3% respectively) when compared to the same month in 2014. An absence of inclement weather in June contributed towards the growth in all sectors. Eight of the 14 UK airports where NATS manages the air traffic recorded growth in commercial air traffic levels (as opposed to total movements) compared to June 2014. Growth was led by London City Airport (+10.2%), which was predominantly due to additional capacity on routes to Edinburgh, Aberdeen and Exeter, as well as routes from Belfast City airport. Glasgow (+9.7%) and Stansted (+6.1%) airports also continued their run of strong growth. 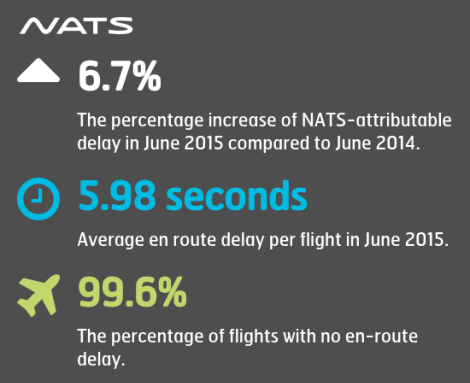 There was 22,410 minutes of NATS-attributable en-route delay in June, which is a 6.7% increase on the comparable delay performance recorded in June 2014.